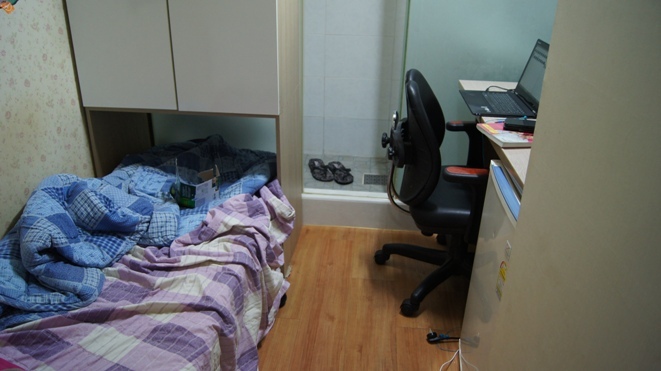 Accommodation in Korea is somewhat different from other countries. A lot of unique options are available for all kinds of budgets, so it would be wise to consider them in addition to the usual suspects of hotels, motels, hostels, guesthouses and more recently, Airbnb. Unfortunately, many are marketed only to Koreans an require knowledge of the language. Here is (hopefully) a complete list of all kinds of accommodation in Korea. This hanok in Hahoe Folk Village (a UNESCO World Heritage Site) was wonderful. By far, my favorite type of accommodation in Korea is the Hanok. 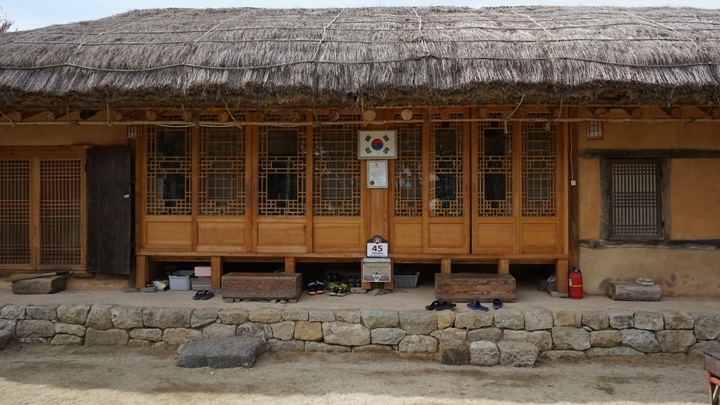 A Hanok is a traditional Korean home, dating back centuries to the Joseon Dynasty or earlier. There are two main types of Hanoks, one with a tile roof (giwajib) and one with a straw roof (chogajib). These vary in price, comfort, basic amenities, and authenticity widely, so be sure to read the reviews. A real hanok is incredibly basic as it was the home where entire extended families lived under one roof in ancient times. Therefore, bathrooms were usually shared, they don’t have beds (you sleep on the floor with blankets as padding), and the ceiling and doors are rather low. However, due to tourism, domestic and international, newer hanoks are being built to suit all tastes, including some in Seoul with the works. 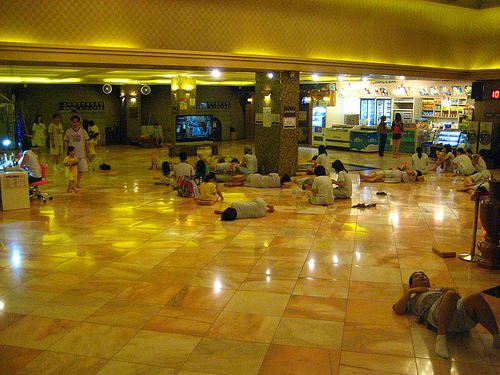 Also, like all accommodation in Korea, the floors are heated. The Hanokstay program is sponsored by the official Korean tourism board and is a good way to find reliable hanoks throughout the country. However, since most hanoks are run independently and the main customers are Korean, the main website is in Korean only. There are about a dozen hanoks listed in VisitKorea’s official English website, which should have English speakers to at least handle bookings. I’ve stayed in hanoks in Hahoe Village and had to call in advanced (in Korean) to book. I had to search for the word “민박” which is explained further below. Since minbaks are part of a home, they sometimes give you some free goodies. 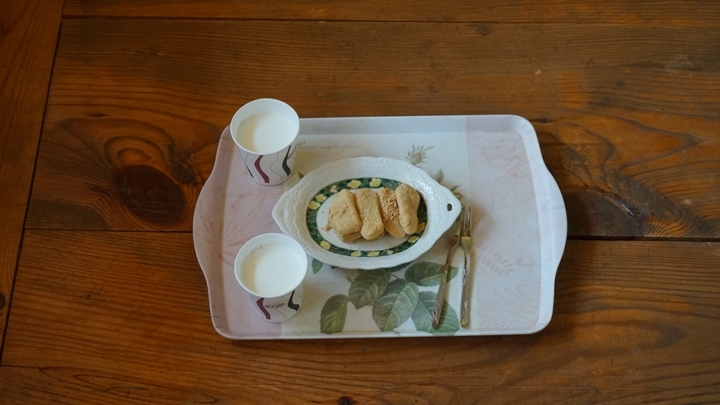 A minbak is a type of guesthouse. Unlike a hostel/hotel, they were originally part of a larger house where the unused rooms were transformed into guest rooms. For this reason, minbaks usually only have a couple of rooms at most to book, so it would be ideal for smaller groups. Hanoks are one type of minbak, but the term encompasses other types of houses as well. Therefore, if you search “민박” you may come across some hanoks. Minbaks are usually small rooms with a shared bathroom and not much in the way of furniture. While they can definitely be found in Seoul too, they are a vestige of an older time and are far more prevalent outside the capital. These are usually your cheapest bet at a room to yourself for the night if all you care about is finding somewhere to sleep in peace or if you’re looking for a different experience. They usually do not have a bed and require you to sleep on the floor on top of padding (but on heated floors). They vary VERY widely, but the good news is that getting one for 30,000 or even 25,000 outside of major cities isn’t too hard. In more popular areas or on weekends though, expect anywhere from 35,000-60,000 a night. The main benefit is availability as even the most remote islands will have a couple of minbaks available. For example, Sado Island down south only has minbaks and pensions available as accommodation. The drawback is that they can be very hit or miss on cleanliness! Website – Usually, they are not listed on any website and require phone bookings or just show up and ask. Search for the word “민박” on any of the major Korean map websites or apps (Google Maps is usually outdated, long story) and call the numbers that come up (in Korean). Analogous to a cabin in western countries, but less secluded. Pension, like the word ‘hotel’ and ‘motel’ these days, can be a rather ambiguous term and encompasses a wide variety of accommodation. However, the most common use is for cabin-type accommodation in beach areas or in more remote destinations like mountains. Pensions are usually not very cheap, costing upwards of 100,000 a night and sky is the limit. However, they are meant to be rented out by groups who split the costs and can be decked out with a yard, a kitchen, BBQ equipment, and the works. 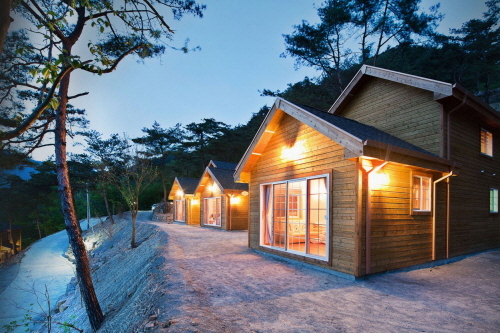 Many Koreans rent these in college (much like I did) for weekend retreats. If you have a big group, and are thinking of going to places like Sokcho or the south west part of the country, and you appreciate an isolated “get away from other people” feeling, this may be for you. Booking info – Some are found on major booking sites, but searching “펜션” the same way as with minbaks works too. Note that the term is ambiguous so see pictures if you can. 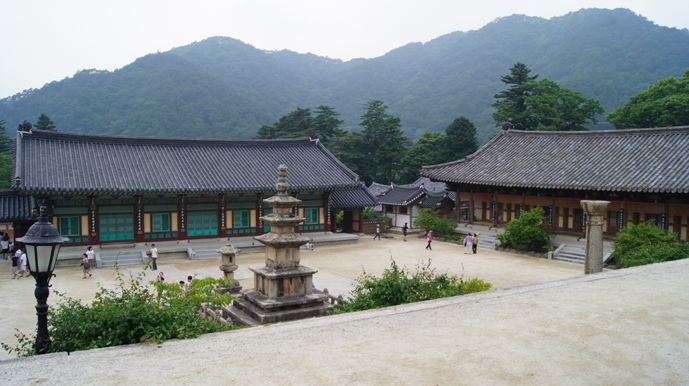 Haeinsa temple (also a UNESCO World Heritage Site), located within Gayasan National Park, participates in the English Templestay program. Interested in experiencing life as a monk for a day? The Templestay program was designed to give you a taste of Zen Buddhist life from the early rise at 3am in the morning, to the 108 bows at midday, to the fully vegetarian meals offered as part of the experience. You better eat every grain the Buddhist way as well or you’re going to get the stink eye! This is more of an experience than a straight up accommodation, but it is definitely one worth trying. Back in 2011 when I first tried it, the price was 50,000 won but it could vary from temple to temple. The price usually includes a guide, two meals, a place to stay (in the temple), and a front side view of the morning and afternoon rituals by the monks of the temple. However, it should be noted that my experience was far more professional and intense than my friend who did it the Korean version of templestay. This could mean it varies from temple to temple of from the Korean to the English program. Like the Templestay, this one isn’t particularly meant to replace an accommodation per se. However, foreigners and locals alike do sometimes stay the night at a jjimjilbang as a cheap and relaxing alternative to a hotel. Jjimjilbangs are saunas that come in all shapes and sizes from holes in the wall that cost no more than 5,000 won per visit (with no time limit), to decked out ones that can cost up to 20,000 won. Like the hanokstay, most of the users are Korean, so most jjimjilbangs will not have English speakers. However, there is one in the basement of Incheon International Airport and Dragon Hill right outside of Yongsan Station (pictured) which can easily accommodate those with no Korean ability. The inside of a ‘Love Motel’ looks no different than any western motel. Some giveaways are the windows (the wooden doors) which can be completely closed to make the room pitch black. The term “love motel” is the one most often used to describe these sometimes seedy establishments. Many, if not most, are designed with one thing in mind, and that is to… well, I think you figured it out from the name. Love motels can be rented for short time (2 hrs), long-er time (4-6 hours) or for the night, so make sure you make it clear if you plan to stay the night. This is my personal go-to outside of Seoul because they are usually all clustered together in smaller towns and it is easy to go one by one and scope them out before settling. Also, it allows me the flexibility of not having to book in advanced. Despite the name, not all are sketchy and are simply a cheaper form of accommodation. On the low end, rooms can go for 30,000. On weekends, they jump up to 40-50,000 but can reach up to even 80-100,000 on very popular weekends and destinations (including Seoul). If you are confident with your Korean skills and plan to use motels extensively, the apps 야놀자 and 야놀자 바로예약 can tell you discounts and ratings on nearby motels. I wouldn’t say this is exactly another “form” of accommodation, just another (native Korean) name for a ‘motel.’ I have found these places to be usually very old, in alleys and the cheapest options around. For those times when absolutely everything affordable is booked and you just don’t want to sleep on the streets, give it a shot. Yeoinsu is another name for it, but it is basically the same thing. 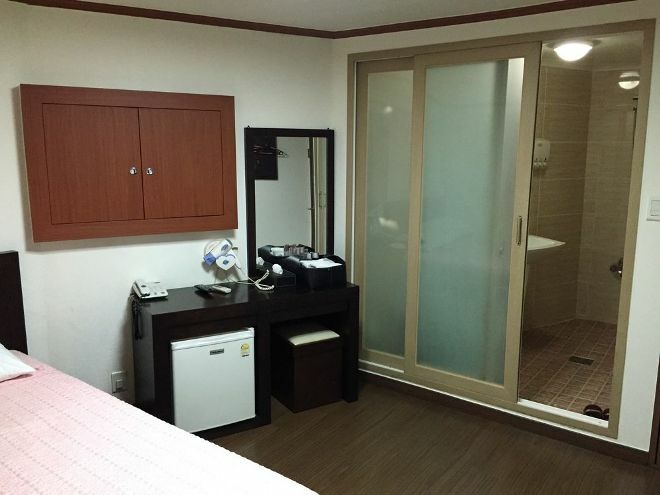 Much like their Japanese cousins, Korean guesthouses tend to be pretty clean and reasonably priced. 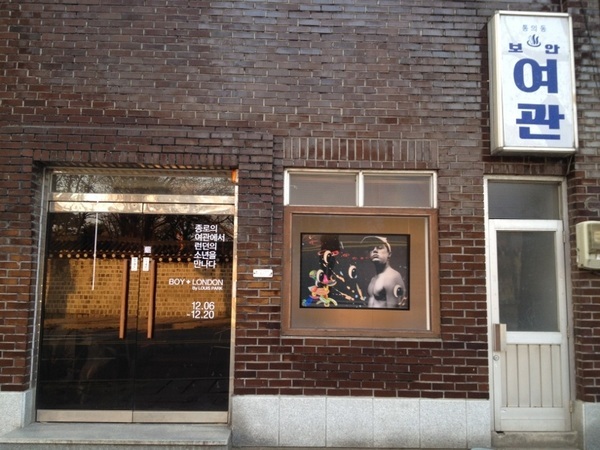 Hostels exist in Seoul, but not really a “thing” with the local population. Because of that, I have found them to usually be staffed with either foreigners or Koreans who speak English rather well. They are also quite cheap compared to hotels, but not exactly abundant outside of Seoul. I did see a huge sign my last visit to Andong in October of a new hostel literally displaying “1st hostel in Andong” and have seen some from time to time in other places. The term ‘hostel’ and ‘guesthouse’ merge from time to time, so it is worth searching for both. Hostelbookers and Hostelworld (same company) are your best bets, but check out Agoda too. Back around 3 years ago when my buddy started Airbnb in Seoul, he was often booked because few people had caught on to this trend. However, now, they are everywhere in Seoul. In the major cities of Busan, Gyeongju, and Daegu, the Airbnb market is booming. However, even in the smaller towns of Kongju and Buyeo, there seem to be one or two properties available. I stayed here for two months. It was not the best experience. A Koshiwon is a tiny shoebox of a place which makes your college dorm feel like a mansion. These come from as little as 6.6 square meters (2 pyeong) with nothing more than a desk and a bed, to 16 square meters (5 pyeong) with an en suite bathroom. For those looking to stay in Korea for an extensive period of time beyond a few weeks but under a year, it is a very viable option and an alternative to an apartment (listed below). You can find some from 200,000 a month to 420,000 monthly and it includes internet, hot water, rice, kimchi (I’m serious), and sometimes ramen. If you’re looking to scope out the situation in Korea before a longer term move, this may be a good option. Be aware, most managers do not speak English, they are rather lonely places to live, and they do not allow outside guests. Who knows though, you may get lucky like I did. The manager was a cool guy and we ended up hanging out almost daily for two months. Korean Level – Beginner – Intermediate (to be able to read the terms and conditions). 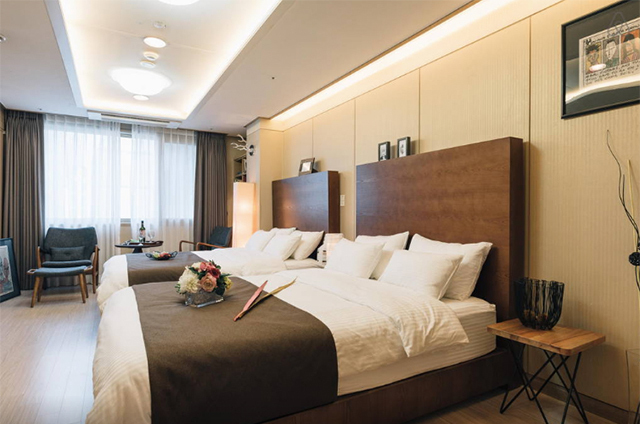 Apartments in Korea can be a headache to get for many reasons, including dealing with long leases, key money, realtors, miscellaneous maintenance fees, and picky landlords. Here is the breakdown. Key Money – is a deposit which ranges from as little as 2 million won to 200 million. Your options will be largely dictated with how much money you have to put down as a deposit. Renting Types – one of the questions you will be asked is what kind of service/accommodation you are looking for. Wolse is a low deposit (2-40 million) with a monthly rent. 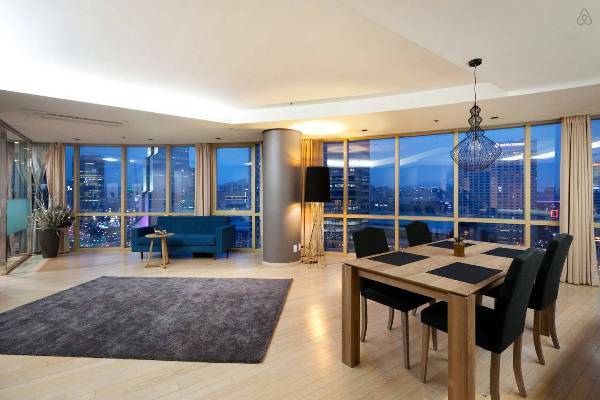 Jeonse is a very high deposit (100s of millions) but no monthly rent. 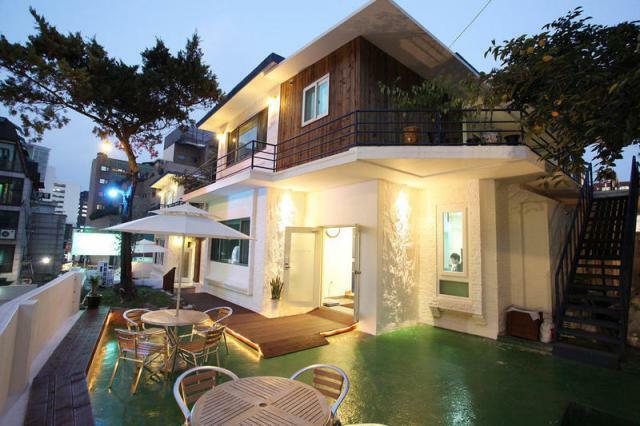 Panjeonse is an inbetween with a high deposit (80-200m) with a small-ish monthly rent. Finally and simply for completeness, there is meme, which means buying. Maintenance Fee – This is a monthly fee charged by the landlord. They usually tell you what it includes, which can be anything from electricity, water, internet, cable tv, cleaning, a security guard, or any combination of those. It also varies from zero to the ridiculous 150,000 I paid in my last apartment. Leases – A standard lease is for 2 years, but you may be able to negotiate a one year lease from certain properties. Again, that would lower your choice of housing. Landlords – What is and isn’t allowed in an apartment is all written out with a realtor as a middle man to make sure all parties understand what they are agreeing to. These range from landlord who simply want you to not burn down their place, to some who don’t want you to put anything on their walls. They are hit or miss and we’ve had to turn some down simply because they had ridiculous demands at signing. Dabang and Jikbang – These two websites / apps have a good percentage of all the properties available for rent. Simply look at the terms, find one you like, and call the associated Budongsan/ 부동산 (realtor) to schedule a viewing. Some of the conditions, including key money amount and rent, are negotiable from time to time. Realtors – A realtor (부동산) is almost always used to rent a place. Once a realtor is contacted to show you a place you like, they will know your range or rent/key money (or they may ask you) and show you similar places if you’d like. In both my experiences renting, I’ve ended up going with a recommended similar place which just hadn’t been put up online yet. Their service isn’t free though. Both you and the landlord pay the realtors for their service, which varies in price depending on the price of the property (calculation). Roughly, for 10 million down and about 800,000 a month, expect to pay around 300,000 won. All budongsan people are not the same though. My experience has ranged from the nicest people in the world, to just people who didn’t give a damn. Proceed carefully and don’t be afraid to walk away. Options – The term “options/옵션” means what furniture is included in the apartment. This can include a washer, fridge, desk, bed, air conditioner, and so on. This one was far more detailed than originally intended, but hey, for completeness! Contracts are usually signed in the realtor office and you pay 10% of the deposit to the landlord that day. The realtor fee and the rest of the deposit along with the first month’s rent are paid at move in. Everything is usually done through wire transfers, which may require a Korean bank account. Korean Level – Advanced or check out Seoulistic’s guide and service below. The Shilla Hotel in Seoul, with Namsan tower in the distance. 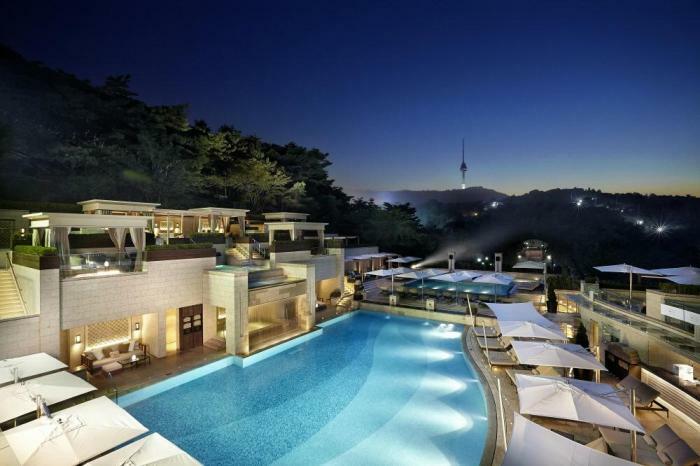 Getting a hotel in Korea is no different from anywhere else. Just thought I’d add this here for completeness! Impressive! you have a lot of compilation of a nice and comfortable place in Korea, I ‘m thinking about Air BnB would be suited for me. thanks for sharing by the way. I am planning to visit korea this year! thanks for sharing this! cheers! Thanks a lot for these useful information ! Do you know if it is easy to find a place to sleep last minute in remote places like countryside villages ? Usually yes, but it is dependent on your Korean speaking level. In nearly any small village, you need to search “minbak” 민박 in Korean. It is an old school style of accommodation which is usually VERY low maintenance with sleeping on the floor (with a comforter). Thats your best bet in very remote places and usually, I don’t look more than a day in advanced except for big holidays. Another option is to search “Motel” in Korean 모텔. Search on Kakao maps (the app) or daum/naver maps on a browser. Usually, there are MANY in a cluster near a train station of bus depot. These are more western style motels and a tad more expensive (avg 50 a night) but more comfortable and they MIGHT speak English. But yea, it is very possible, I do it all the time. It should be noted that I do speak some Korean but with a few phrases, you should be fine.